Coccidioidomycosis results from airborne infections caused by either Coccidioides immitis or C. posadasii. Both are pathogenic fungi that live in desert soil in the New World and can infect normal hosts, but most infections are self-limited. Disseminated infections occur in approximately 5% of cases and may prove fatal. Mouse models of the disease have identified strains that are resistant (e.g. DBA/2) or susceptible (e.g. C57BL/6) to these pathogens. However, the genetic and immunological basis for this difference has not been fully characterized. Microarray technology was used to identify genes that were differentially expressed in lung tissue between resistant DBA/2 and sensitive C57BL/6 mice after infection with C. immitis. 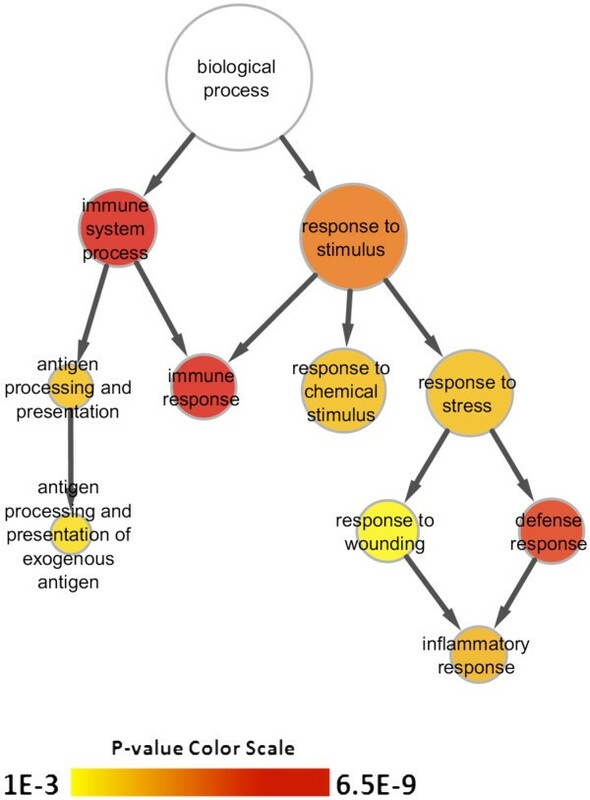 Differentially expressed genes were mapped onto biological pathways, gene ontologies, and protein interaction networks, which revealed that innate immune responses mediated by Type II interferon (i.e., IFNG) and the signal transducer and activator of transcription 1 (STAT1) contribute to the resistant phenotype. In addition, upregulation of hypoxia inducible factor 1A (HIF1A), possibly as part of a larger inflammatory response mediated by tumor necrosis factor alpha (TNFA), may also contribute to resistance. Microarray gene expression was confirmed by real-time quantitative PCR for a subset of 12 genes, which revealed that IFNG HIF1A and TNFA, among others, were significantly differentially expressed between the two strains at day 14 post-infection. These results confirm the finding that DBA/2 mice express more Type II interferon and interferon stimulated genes than genetically susceptible strains and suggest that differential expression of HIF1A may also play a role in protection. Coccidioidomycosis is one of the endemic mycoses in the New World caused by one of two closely related dimorphic fungi, Coccidioides immitis and C. posadasii. These fungi grow in the arid alkaline soil of the Lower Sonoran Life Zone and infectious arthroconidia are aerosolized by wind and inhaled. Once inside the lung the fungus converts into the pathognomonic spherule under the influence of increased temperature and pCO2. It is estimated that 150,000 people are infected each year of which approximately 60% resolve on their own and do not require medical intervention [2, 3]. The others have either symptomatic pneumonias or they develop disseminated disease . The risk factors for dissemination are T cell deficiencies such as AIDS, organ transplantation, and pregnancy, as well as treatment with tumor necrosis factor alpha (TNF-α) inhibitors [5, 6]. Furthermore, the risk of disseminated coccidioidomycosis is 5–10 times higher for previously healthy African-Americans and Filipinos than for Caucasians [7, 8]. This strongly suggests that there is a genetic basis for susceptibility to disseminated coccidioidomycosis. The immune response of patients who develop disseminated coccidioidomycosis is different from those with self-limited infections. The former make high titers of antibody against fungal antigens and do not have positive skin tests (Th2), and conversely, the latter respond to infection with low titers of antibody and skin test reactivity . The genetic basis for the aberrant immune response in susceptible individuals is not clearly defined. Several years ago we discovered that inbred strains of mice vary over 4 logs in their susceptibility to infection with C. immitis and that resistance is the dominant phenotype . This proved to be a polygenic trait, and a resistance locus was identified on chromosome 6 using recombinant inbred BXD lines . C57BL/6 mice are more sensitive to infection with C. immitis than DBA/2 mice such that nearly all C57BL/6 mice die between day 16 and 18 post-infection . We have shown that infected C57BL/6 mice make more IL-10 and IL-4 and less interferon gamma (IFN-γ) in their lungs compared to DBA/2 mice . IL-10 has pleiotropic effects on different cell types that affect the acquired immune response resulting in inhibition of the development of Th1 immune responses . In the current work, microarray analysis was used to identify genes differentially expressed between lung tissue samples from resistant DBA/2 and sensitive C57BL/6 mice following infection with C. immitis. 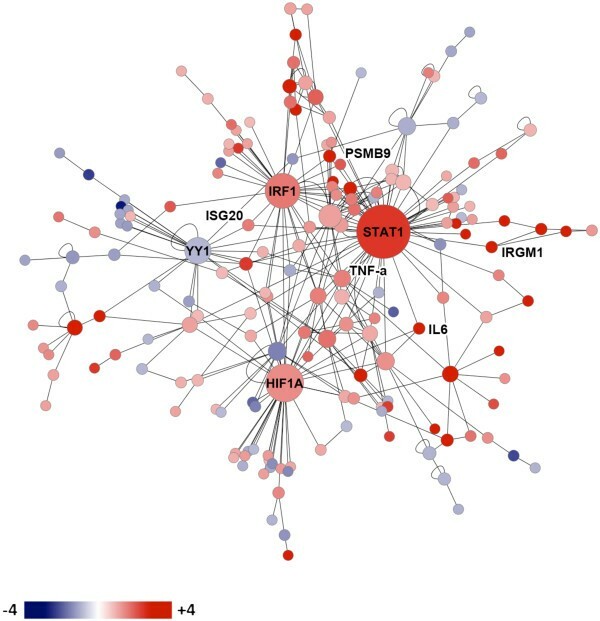 Differentially expressed genes were mapped onto biological pathways, gene ontologies and protein networks in order to fully characterize the biological processes that contribute to a protective response against C. immitis infection. The colony forming units (CFUs) in the right (R) lung and spleen of DBA/2 and C57BL/6 mice were determined after intra-nasal (i.n.) infection with C. immitis arthroconidia. We chose three time points after infection for analysis (day 10, 14 and 16). Since mice were only infected with 50 CFU and not all of them were inhaled, day 10 is the earliest day when there are enough organisms in the lungs to reliably quantitate pulmonary infection in all mice. C57BL/6 mice began to die on day 16 so this was selected as the last time point, and day 14 was chosen as an intermediate time point. On day 10 after infection there were equal numbers of CFU in the lungs of both strains of mice and we could not detect dissemination by culturing their spleens (Figure 1). 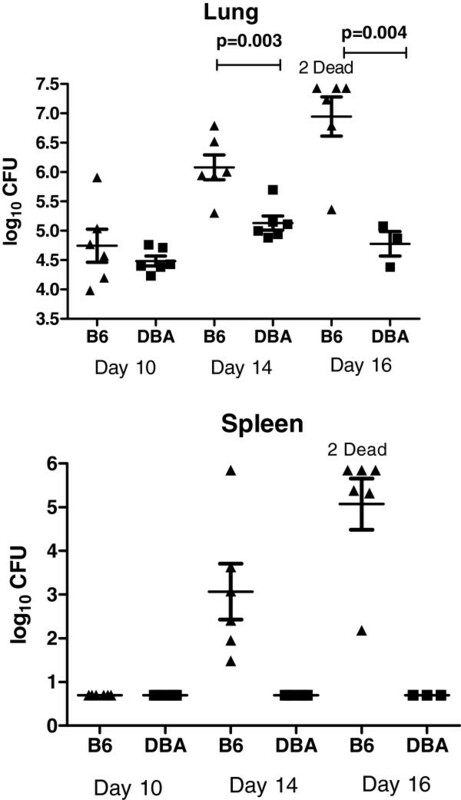 On day 14 and 16 post-infection DBA/2 mice had 10 to 100 fold fewer CFU/lung, and in this experiment no DBA/2 mice had detectable dissemination to the spleen, whereas all the C57BL/6 mice had positive spleen cultures. Comparison of C. immitis infection between resistant DBA/2 and sensitive C57BL/6 mice. Mice were infected (i.n.) and then sacrificed at the indicated intervals. The right lung and spleen of each mouse was homogenized and cultured quantitatively. Each symbol represents an individual mouse and the horizontal lines are the geometric mean ± standard error of the mean. The infection proceeded more rapidly in the lungs of the C57BL/6 mice and dissemination to the spleen occurred only in this strain, another indication of their increased susceptibility to infection. P-values comparing lung CFU were calculated with an unpaired Student’s t-test using GraphPad Prism (San Diego, CA). There was no significant difference between CFU in the lungs of the two strains on day 10 after infection. Genes that were differentially expressed between mouse strains (DBA/2 and C57BL/6) before (day 0) and after (day 10, 14 and 16) infection with C. immitis were identified by microarray analysis in an unbiased manner, in order to determine the basis for resistance. A total of 1334 genes were differentially expressed between mice strains with a fold change ≥ 2 or ≤ -2 (log2 fold change ≥ 1 or ≤ -1, respectively) for at least one time point. The top 100 of these differentially expressed genes indicated a wide range of different expression profiles over the time course (Figure 2). We focused on those genes that showed no differential gene expression prior to infection (day 0) but were then expressed to different degrees in DBA/2 and C57BL/6 mice after infection. Several genes fitting this profile were related to the innate/acquired immune responses as mediated by IFN , and the following IFN-stimulated genes (ISGs) were selected for real-time quantitative PCR (RT-qPCR) analysis: chemokine C-X-C motif ligand 9 (CXCL9), immunity-related GTPase family M member 1 (IRGM1), interferon stimulated exonuclease gene 20 kDa (ISG20), proteosome subunit beta type 9 (PSMB9), signal transducer and activator of transcription 1 (STAT1) and ubiquitin D (UBD). However, the direct interpretation of red for upregulation and blue for downregulation in Figure 2 may be misleading as the color scale reflects the ratio of gene expression in DBA/2 over C57BL/6 mice. Thus a red box in Figure 2 could result either from a gene that was upregulated to a greater extent in DBA/2 than in C57BL/6 mice, or from a gene that was downregulated to a lesser extent (compared to day 0) in DBA/2 compared to C57BL/6 mice (see Materials and Methods). Therefore, fold changes were also calculated by comparing expression levels post-infection (days 10, 14 and 16) to pre-infection levels (day 0) in order to identify the direction of the change in gene expression (Figure 3). This revealed that CXCL9, IRGM1, ISG20, PSMB9, STAT1 and UBD at days 10, 14, and 16 were upregulated genes in DBA/2 mice. Post- versus pre-infection fold changes for every gene shown in Figure 2, and not just those selected for RT-qPCR validation (Figure 3), are available in Additional file 1: Figure S1. A heatmap depicting the top 100 modulated genes that were differentially expressed between DBA/2 and C57BL/6 mice. Fold changes were calculated between mice strains prior to (day 0) and following infection (days 10, 14, and 16) with C. immitis. For each gene, the absolute peak log2 fold change (FC) was identified across time points and the top 100 included in the heatmap. 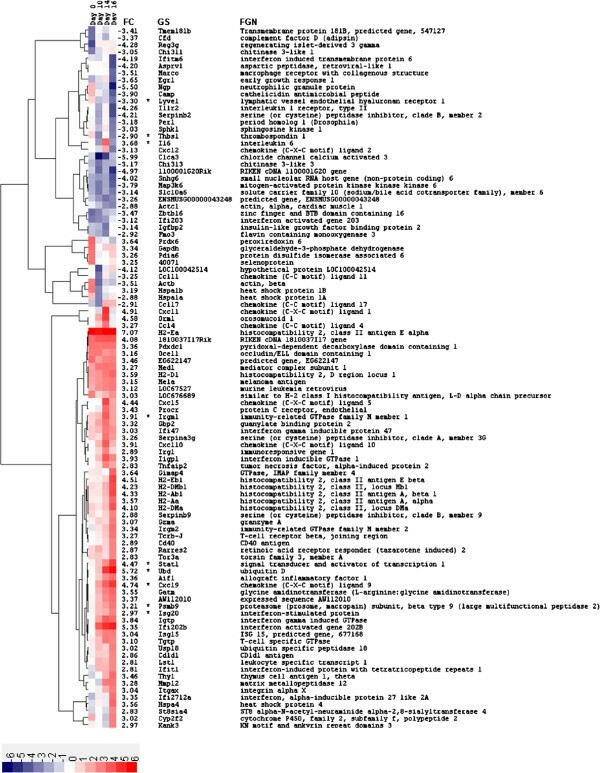 The log2 fold change scale is indicated at the bottom of the heatmap, where red shading indicates greater expression in DBA/2 compared to C57BL/6 mice and blue shading represents lesser expression. For example, red shading will result if a gene is expressed to a greater extent in DBA/2 compared to C57BL/6 mice or if a constitutively expressed gene is downregulated in DBA/2 to a lesser extent compared to C57BL/6. Therefore, the direction of gene expression changes for each of the top 100 modulated genes is presented in Additional file 1: Figure S1 by dividing expression levels at post-infection time points (day 10, 14, and 16) by those in the uninfected control (day 0). Hierarchical clustering of genes based on their expression profiles over the time course is reflected in the dendogram to the right of the heatmap and was performed by calculating distances using the Pearson correlation metric and then clustering distances using the average linkage method. The expression of genes marked with an asterisk (*) was confirmed by RT-qPCR. Annotation columns are as follows: FC, peak log2 fold change; GS, gene symbol; FGN, full gene name. A heatmap of fold changes calculated by comparing gene expression at post-infection time points to day 0 (pre-infection) for the 13 targets selected for RT-qPCR analysis. Calculating fold changes in this way provides confirmation of the direction (up or down) of expression changes. Fold change is presented on a log2 scale as indicated at the bottom of the heatmap, where red shading indicates upregulation and blue shading represents downregulation of gene expression. The genes were clustered based on their expression profiles as described in the legend for Figure 2. The abbreviations for the annotation columns are defined as for Figure 2. Genes expressed to a lesser extent in DBA/2 versus C57BL/6 mice following C. immitis infection are also interesting and these too were validated by RT-qPCR (see below). Thrombospondin 1 (THBS1) and the lymphatic vessel endothelial hyaluronan receptor 1 (LYVE1) fit this profile (Figure 2) and were selected for RT-qPCR analysis. Again, comparison of gene expression between pre- and post-infection time points confirmed these genes were actually more downregulated in DBA/2 mice (Figure 3). We used the Database for Annotation, Visualization, and Integrated Discovery [DAVID  to identify pathways that were significantly over-represented in the set of 1334 differentially expressed genes. Four pathways were enriched for differentially expressed genes with a false discovery rate (FDR) corrected p-value <0.05, and the majority of these pathways were associated with immune responses (Additional file 2: Table S1). In agreement with the large number of ISGs identified in the top 100 modulated genes (Figure 2), the two pathways containing the greatest enrichment for differentially expressed genes were the Chemokine signaling and Cytokine-cytokine receptor interaction pathways. The fold changes associated with the differentially expressed genes at day 14 post-infection were superimposed on the Chemokine signaling pathway and visualized using Cytoscape (Figure 4). Chemokine signaling clearly contributes to the upregulation of ISGs since the following signaling cascade is upregulated at the transcriptional level: Chemokine → Chemokine receptor (R) → JAK2/3 → STAT → ISG expression (Figure 4). 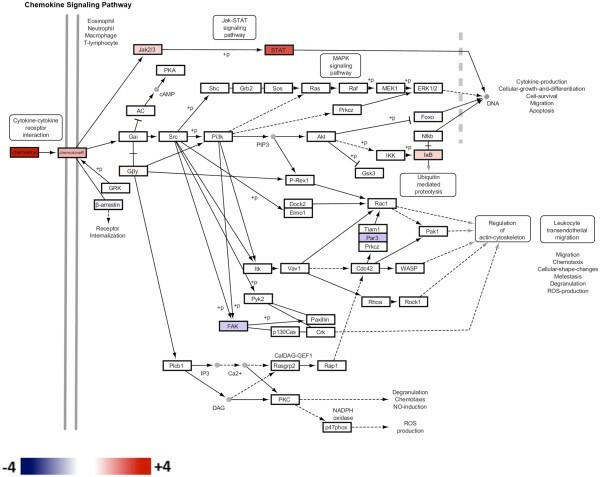 Chemokine Signaling Pathway from the KEGG database (ID: mmu04062) overlaid with log 2 fold change values for genes differentially expressed between DBA/2 and C57BL/6 at day 14. The scale for log2 fold change values is indicated at the bottom of the pathway diagram, where red shading indicates greater expression in DBA/2 compared to C57BL/6 mice and blue shading represents lesser expression. Genes not differentially expressed, i.e., with a fold change between −2 and +2 (log2 fold change between −1 and +1) are depicted in white. The identification of gene ontology (GO) terms significantly over-represented in the set of 1334 differentially expressed genes was performed using the Biological Networks Gene Ontology (BiNGO) tool , which preserves the hierarchical relationship among ontology terms (Figure 5). Using an FDR corrected p-value cut-off <0.001 the three most significant GO terms were: immune system process, immune response, and defense response. Therefore, the immune related terms revealed by GO analysis agree with the results obtained from pathway analysis. The entire list of GO terms that were significantly enriched for differentially expressed genes at an FDR corrected p-value <0.05 are available in Additional file 2: Table S2. Hierarchical depiction of GO terms significantly over-represented in the set of genes that were differentially expressed with a fold change ≥ 2 or ≤ -2 (log 2 fold change ≥ 1 or ≤ -1, respectively) between DBA/2 and C57BL/6 mice at any time point (N = 1334). The size of the node associated with each GO term is relative to the number of differentially expressed genes belonging to that term. The color scale indicates the level of significance associated with each node with red being the most significant. For display purposes only GO terms with an FDR corrected p-value <0.001 are depicted. The full list of significant GO terms using an FDR corrected p-value cut off <0.05 is available in Additional file 2: Table S2. Protein-protein and protein-DNA interactions between 416 genes that were differentially expressed between mice strains at day 14 were identified using MetaCore (GeneGo, St. Joseph, MI). The resulting protein interaction network depicted in Figure 6 consists of four major hubs: hypoxia inducible factor 1A (HIF1A), interferon regulatory factor 1 (IRF1), STAT1, and Yin Yang 1 (YY1). These hubs represent transcription factors, which themselves, as well as their targets, were differentially expressed between mouse strains. HIF1A, IRF1, and STAT1, were expressed to a greater extent in DBA/2 compared to C57BL/6 mice, and YY1 to a lesser extent. STAT1 is the largest hub representing the transcription factor regulating the most differentially expressed genes and it was previously selected as a target for RT-qPCR confirmation from the top 100 modulated genes (Figure 2). YY1 is a transcription factor whose “yin-yang” designation reflects its ability to both activate and repress transcription through interactions with histone acetylases and deacetylases, respectively . A novel finding from the protein network analysis was the hub HIF-1α, which is a transcription factor that plays a central role in the cellular and systemic responses to hypoxia. HIF-1α is regulated at the post-translational level, which results in increases in protein half-life, and also at the transcriptional level by NF-κB [18, 19]. HIF1A was selected for gene expression confirmation by RT-qPCR, as was interleukin 6 (IL6), since it is a transcriptional target of both HIF-1α and Stat1 [20, 21]. Direct protein interaction network constructed from the genes differentially expressed with a fold change ≥ 2 or ≤ -2 (log 2 fold change ≥ 1 or ≤ -1, respectively) between DBA/2 and C57BL/6 mice at day 14 following C. immitis infection (N = 416). MetaCore was used to identify protein-protein and protein-DNA interactions between the protein products of differentially expressed genes and Cytoscape was used to visualize the network. Log2 fold changes were superimposed on this protein network such that red indicates greater expression in DBA/2 versus C57BL/6 mice, and blue lesser expression, as indicated by the scale bar. Each node represents a gene and the size of a node is indicative of the number of interactions the product of each gene makes at the protein level. The largest nodes are labeled HIF1A, IRF1, STAT1 and YY1, and represent hubs that correspond to transcription factors. Stat1 and Irf1 are both transcription factors that upregulate the expression of ISGs and thus corroborate the presence of ISGs in the top 100 modulated genes (Figure 2), as well as the identification of chemokine related pathways (Figure 4). The well-characterized ISGs selected for RT-qPCR analysis, IRGM1, ISG20 and PSMB9[22, 23], were targets of Stat1 regulation in protein network analysis (Figure 6). In contrast, Ubd (also known as Fat10) and Cxcl9, were not identified as regulatory targets of STAT1 in protein network analysis. However, they were both retained for RT-qPCR analysis since these genes are clearly regulated by IFN-γ as previously demonstrated using promoter/reporter gene constructs in the case of Ubd[24, 25] and gene expression studies in the case of Cxcl9. Microarray gene expression (Figure 2), pathway (Figure 4), and protein network (Figure 6) analysis, clearly indicated that interferon-mediated innate immune responses are upregulated in DBA/2 mice and thus are associated with resistance to C. immitis infection. The upregulation of the ISGs CXCL9 and UBD in DBA/2 mice, which are predominantly modulated by Type II IFN [14, 27, 28], suggested that the interferon gamma (IFNG) gene should also be upregulated in this mouse strain. However, IFNG was not a top 100 modulated gene (Figure 2) and upon closer examination of the microarray data was found to be expressed below background levels (data not shown). Since our initial time course may have missed the peak of induction of IFNG, a targeted analysis of cytokine expression was performed at an additional time point (day 15) using a complementary technology, namely the Mouse Common Cytokines Gene Array from SABiosciences (Frederick, MD, USA). This cytokine array confirmed that IFNG was expressed to a greater extent in DBA/2 compared to C57BL/6 mice with a log2 fold change of 1.50 (actual fold change of 2.82, Additional file 1: Figure S2). The cytokine with the greatest differentially expression between mice strains at day 15 detected by the Mouse Common Cytokines Gene Array was interleukin 17A (IL17A), which had a log2 fold change of 1.83 (actual fold change of 3.56). Therefore, IFNG and IL17A were also selected as targets for RT-qPCR analysis at days 14 and 16 in order to determine if this more sensitive technique could confirm expression of these cytokines at these time points. To validate microarray gene expression results and further confirm the role of responses to IFN-γ and HIF-1α in the resistance of DBA/2 mice to C. immitis infection, RT-qPCR analysis was performed at days 10 (Additional file 1: Figure S3A), 14 (Figure 7), and 16 (Additional file 1: Figure S3B) post-infection for the following thirteen targets: CXCL9, HIF1A, IFNG, IL6, IL17A, IRGM1, ISG20, LYVE1, PSMB9, STAT1, THBS1, TNFA and UBD. The differential gene expression between mice strains detected by microarray was confirmed at day 14 by RT-qPCR for all targets at the 2-fold level (log2 fold change of 1) except for ISG20. In addition, although microarray analysis did not indicate that IFNG and IL17A were differentially expressed between mice strains, RT-qPCR analysis confirmed that both were expressed to a greater extent in DBA/2 compared to C57BL/6 mice at day 14 post-infection with C. immitis. Even with a limited number of biological replicates at day 14, the majority of targets (CXCL9, HIF1A, IFNG, IL17A, IL6, IRGM1, PSMB9, STAT1, TNFA and UBD) were significantly differentially expressed (p <0.05, t-test) between mouse strains (Figure 7). Confirmation of gene expression differences by RT-qPCR between DBA/2 and C57BL/6 mice at day 14 following C. immitis infection. The fold change for each gene, calculated by dividing the expression level in DBA/2 mice by the expression level in C57BL/6 mice is presented for RT-qPCR data (grey bars). These fold change differences are also compared to microarray results (black bars) for each gene. For the RT-qPCR data, gene expression was assessed using 2 independent samples from C57BL/6 mice and 3 independent samples from DBA/2 mice. RT-qPCR gene expression data (2-∆∆CT) was averaged within mouse strains and then used to calculate log2 fold change values between strains for direct comparison to microarray data. A log2 fold change of 1 equates to an actual fold change of 2. A positive fold change indicates the gene was expressed to a greater extent in DBA/2 mice, and a negative fold change means higher expression in C57BL/6. An asterisk (*) indicates that the gene was significantly differentially expressed (p <0.05, t-test) between mice strains at day 14. Analysis of the gene expression differences between mice strains resistant (DBA/2) and sensitive (C57BL/6) to infection with C. immitis identified a large number of ISGs associated with putative control of this fungal pathogen. Innate/adaptive immune responses as mediated by Type II interferon (IFN-γ) have previously been associated with resistance to infection with C. immitis[29, 30]. For example, Magee and Cox  found that IFN-γ protein levels as measured by ELISA were significantly elevated in DBA/2 mice compared to another susceptible strain (BALB/c) following infection with C. immitis. Furthermore, treatment of DBA/2 mice with an anti-IFN-γ monoclonal antibody resulted in a significant decrease in their ability to control this fungal pathogen after pulmonary challenge. This current study expands on their work by clearly demonstrating that downstream ISGs are expressed to a greater extent in resistant DBA/2 compared to sensitive C57BL/6 mice (Figures 2 and 7) and that these genes are modulated by the JAK/STAT pathway (Figures 4 and 6), most likely activated by IFN-γ (Figure 7). These findings are highly relevant to human infection since patients with congenital deficiencies of IFN-γ and the interleukin 12 receptor beta 1 (IL-12rβ1) are susceptible to disseminated coccidioidomycosis [30, 31]. The upregulation of ISGs (i.e. CXCL9, IRGM1, PSMB9, STAT1 and UBD) in DBA/2 compared to C57BL/6 mice was confirmed by RT-qPCR at all days post-infection (Figure 7 and Additional file 1: Figure S3). STAT1 is integral to JAK/STAT signaling triggered by Type I and II IFN and upregulates a number of ISGs that are involved with the host defense against pathogen infection . UBD was the ISG that exhibited the greatest upregulation in DBA/2 mice (Figures 2 and 7), and is induced to a greater extent by IFN-γ than IFN-α in human immune and non-immune cells . Several roles have been ascribed to UBD including targeting proteins for proteosomal degradation , activation of the nuclear factor of kappa light polypeptide gene enhancer in B-cells 1 (NF-κB) , which is a central mediator of innate immunity, as well as a functional involvement in the programmed cell death mediated by TNF-α in the murine B8 fibroblast cell line . CXCL9 (or MIG) is predominantly upregulated by IFN-γ but may also be activated by Type I IFNs  and binds the CXCR3 receptor, which is expressed on T cells in order to promote Th1 responses . PSMB9, encoded in the major histocompatibility complex class II region, is another gene inducible by both Type I and II IFNs and is a constituent of the immunoproteosome [37–39]. This gene facilitates a link between the innate and adaptive immune response since site directed mutagenesis studies have revealed a role for PSMB9 in antigen processing and presentation . PSMB9 was the only ISG that was expressed at significantly higher levels in DBA/2 mice at both day 10 (Additional file 1: Figure S3A) and 14 (Figure 7), which suggests that the protein product of this gene may play a key role in resistance to C. immitis infection. IRGM1 is particularly noteworthy since it belongs to a family of immunity-related GTPases whose other members, IRGM2 and IRGM3 (or IGTP), were also expressed to a greater extent in resistant DBA/2 compared to susceptible C57BL/6 mice (Figure 2). IRGM1-deficient mice are more susceptible to infection with Mycobacterium tuberculosis, M. avium, Listeria monocytogenes and Salmonella enterica serovar Typhimurium, as assessed by both mouse survival and bacterial loads in tissues, whereas IRGM3-deficient mice exhibit normal resistance [41, 42]. In contrast, both IRGM1 and 3 are required for IFN-γ modulated control of Toxoplasma gondii in murine macrophages . It appears that IRGM1 is critical for normal motility of activated macrophages in mouse models suggesting a pivotal role for this protein in the innate response to infection in vivo. The relevance of the IRGM family to human coccidioidomycosis is unclear because the single gene in this family in humans, IRGM, is considerably truncated and is not regulated by IFN-γ . However, IRGM does play a role in human innate immunity since it is necessary for the execution of the autophagic pathway in macrophages and the control of intracellular Mycobacteria. Greater expression of IFNG and IL17A were detected in DBA/2 mice at day 15 post-infection using the Mouse Common Cytokines Gene Array (Additional file 1: Figure S2). It was therefore surprising that microarray analysis did not detect differential expression of these cytokines between mice strains at days 14 and 16 (Figures 2 and 3), but RT-qPCR analysis was able to do so (Figure 7 and Additional file 1: Figure S3). It is unclear why microarray analysis was unable to detect the expression of these cytokines especially since IFNG expression had been detected using the same array platform (MGU74Av2) in lung tissue from C57BL/6 mice exposed to lipopolysaccharide (LPS) . This array platform was designed using the C57BL/6 genome and thus it is possible that these cytokines were not detected because they were not expressed to high levels in C57BL/6 by C. immitis infection and contained too many polymorphisms in the DBA/2 homologues for efficient hybridization. What is clear from the RT-qPCR result is that IFNG and IL17A are expressed to a greater extent in DBA/2 compared to C57BL/6 mice. The upregulation of ISG20 in DBA/2 mice originally identified by microarray analysis was also not confirmed by RT-qPCR analysis (Figure 7). The probe set on the microarray (103432_at) and the TaqMan assay (Mm00469585_m1) for ISG20 (NM_001113527) target different regions of this transcript (i.e. 2nd and 3rd versus 1st and 2nd exons, respectively) so alternative splicing could account for the discrepancy . C. immitis infection also resulted in the downregulation of genes in DBA/2 versus C57BL/6 mice (Figures 2 and 3), which was confirmed by RT-qPCR (Figure 7, S3A and S3B). THBS1 encodes thrombospondin, an extracellular protein that binds a large number of substrates (calcium, heparan sulfate, integrins, the CD36 macrophage scavenger receptor, and transforming growth factor beta 1 [TGF-β]) to modulate cellular attachment, migration, differentiation, and proliferation . IFN-γ appears to regulate THBS1 at the post-transcriptional level in keratinocytes and downregulates THBS1 mRNA in conjunction with TNF-α . THBS1-deficient mice have spontaneous pneumonia that leads to pulmonary hemorrhage, macrophage infiltrations and permanent damage to the lungs, which suggests that this protein is important for maintaining normal pulmonary homeostasis by limiting the extent and/or duration of inflammation . Therefore, it is possible that the downregulation of THBS1 at day 16 in DBA/2 mice facilitates inflammatory responses that contribute to resistance to C. immitis infection, but may also contribute to the long term damage to the lung of DBA/2 mice that eventually leads to their death . Downregulation of LYVE1 in DBA/2 versus C57BL/6 mice is also consistent with a stronger inflammatory response in DBA/2 mice following C. immitis infection. Johnson et al. previously demonstrated that an inflammatory response induced in primary human dermal lymphatic endothelial cells through treatment with TNF-α led to the downregulation of LYVE1 at the transcriptional level. The LYVE1 gene codes for a type I integral membrane receptor that was thought to function in hyaluronan clearance and hyaluronan-mediated leukocyte adhesion, although this biological role has not been confirmed in knockout mice [50, 51]. Consistent with the role of TNF-α in modulating expression of both of these genes (THBS1 and LYVE1) we found that TNF-α was more highly expressed in DBA/2 mice at day 14 by both microarray (fold change of 3.43, data not shown) and RT-qPCR analysis (Figure 7). Protein interaction network analysis identified the transcription factor HIF1A as a network hub. HIF1A was upregulated to a greater extent at day 14 in resistant DBA/2 versus susceptible C57BL/6 mice, and this was confirmed by RT-qPCR (Figure 7). Previously it was thought that the only regulation of HIF activity was the result of hypoxia increasing HIF-1α levels post-transcriptionally by inhibition of proteosomal degradation of the protein following prolyl hydroxylation , but NF-κB also induces HIF1A expression at the transcriptional level . Since TNF-α can stimulate NF-κB activity , this implies there is cross talk between NF-κB, TNF-α, and HIF-1α, even under normoxic conditions. Since both mouse strains had pneumonia and we did not measure oxygen saturations, we cannot exclude an influence of a hypoxia-induced increase in HIF-1α in the lungs of both strains after infection. However, C57BL/6 mice were clearly afflicted with more extensive lung disease (Figure 1) so this strain might be expected to mount a stronger hypoxic response leading to higher levels of HIF-1α. Since there was more expression of HIF1A mRNA in DBA/2 mice at day 14, it appears that the stronger induction of HIF1A in DBA/2 mice may be independent of hypoxia. Hypoxia and inflammation occur in human patients infected with C. immitis[55, 56] and both those conditions are known to increase levels of the HIF-1α protein . It is quite likely that hypoxia and inflammation act synergistically to increase the level of HIF-1α in this infection, as it has in other models of infection in mice . Cox and Magee  noted that spleen cells from DBA/2 mice previously infected with C. immitis and stimulated with formalin-killed spherules produced higher levels of TNF-α than C57BL/6 mice. Furthermore, our previous studies have shown that TNF-α deficient mice cannot be successfully immunized with a live, attenuated vaccine strain of C. immitis. Given the central role of TNF-α in the inflammatory response it is not surprising that the inhibition of this cytokine is a risk factor for the dissemination of C. immitis in human patients . These observations suggest that TNF-α plays a beneficial role in resistance to coccidioidomycosis, perhaps through activation of NF-κB and HIF-1α. Encouragingly, TNFA, HIF1A and a transcriptional target of HIF1A (IL6) were all upregulated to a greater extent in DBA/2 compared to C57BL/6 mice at day 14 (Figure 7). This suggests the following activation cascade: TNFA → NF-κB → HIF1A → IL6; where NF-κB is primarily regulated at the protein level by degradation of inhibitory IkB proteins and not upregulated at the transcriptional level . However, this result must be interpreted with care since by day 16, TNFA, HIF1A, and IL6 are upregulated in C57BL/6 mice to a greater extent than in DBA/2 mice (Figure 3 and Additional file 1: Figure S3B). Cytokines promoting Th17 development (i.e., TGF-β, IL-6, and IL-1β) and those secreted from Th17 cells (i.e., IL-17a)  exhibited a similar pattern of gene expression, i.e., upregulated in DBA/2 at day 14 followed by a receding difference (TGFB, IL1B, and IL17A) or a reversal in differential expression (IL6) at day 16 (Figure 7, Additional file 1: Figure S3, and data not shown). Recently Cole et al. demonstrated that loss of a functional Th17 receptor resulted in decreased protection of C57BL/6 mice immunized with an attenuated mutant vaccine of C. posadasii and subsequently challenged with a virulent strain. It is plausible that an early inflammatory response coupled with the development of Th17 immune responses at day 14 contributes to the resistance of DBA/2 to infection with C. immitis. However, it is plausible that by day 16 there was so much infection in C57BL/6 lungs that IL-6 and TNF-α levels increased so that they were more highly expressed in C57BL/6. In summary, the immune response as mediated by Type II IFN (i.e., IFN-γ) is clearly greater in the strain of mice that better controlled C. immitis infection. This adds support to the anecdotal report of successful treatment of patients suffering from coccidioidomycosis with IFN-γ therapy . Modulation of HIF-1α responses that are associated with inflammation and hypoxia may also contribute to the resistance of DBA/2 mice to this fungal pathogen. Future work will focus on a more finely graded time course in order to fully characterize the genes differentially expressed between DBA/2 and C57BL/6 mice strains. Recently, deep sequencing methods (e.g. SAGE-Seq and RNA-Seq) have been proposed to analyze the expression of genes in the entire transcriptome . While RNA-Seq analysis would not change the central findings of this paper, it is a more sensitive digital technique that might identify a greater number of genes, as well as alternatively spliced variants, that may be differentially expressed between DBA/2 and C57BL/6 mice. C57BL/6 and DBA/2 mice were purchased from the Jackson Laboratory (Bar Harbor, ME). Arthroconidia from C. immitis (RS strain) were harvested as previously described , suspended in buffered saline and kept at 4°C prior to infecting the mice. All animal experiments were approved by the Institutional Animal Care and Use Committee at the VA Medical Center, San Diego. Twenty-four mice from each strain (C57BL/6 and DBA/2) were infected i.n. with 50 arthroconidia of C. immitis. One additional mouse per strain was used as an uninfected control. Eight mice from each strain were sacrificed at either day 10, 14, or 16 post-infection. Lungs and spleens were rapidly removed and one lobe of the left lung was immediately minced and frozen in liquid nitrogen and stored at −70°C. The right lung and spleen were homogenized in 1 mL of sterile saline and serially diluted in saline for quantitation of CFUs using Sabouraud agar. RNA was extracted from frozen lung tissue using the ULTRASPECTM Total RNA Isolation Kit (Biotecx Labs, Houston, TX). RNA quality was confirmed using agarose gels and concentration determined using a spectrophotometer. For each strain, three mice were chosen that had numbers of CFU closest to the median calculated for the eight mice in that strain at a particular time point, and equal amounts of RNA from the lung of each of the three mice were pooled for microarray gene expression analysis. Double-stranded cDNA was synthesized from RNA isolated using the MessageAmpTM aRNA Kit (Ambion, Austin, TX). Biotinylated cRNA was in vitro transcribed from double-stranded cDNA template using MegaScript High-Yield Transcription Kit (Ambion). Resulting cRNA (15 μg) was purified using the MessageAmpTM aRNA Kit and fragmented before hybridization to Affymetrix GeneChip MGU74Av2 microarrays (12,488 probes). GeneChips were washed and stained with streptavidin phycoerythrin according to manufacturer’s instructions prior to scanning with an Agilent Gene Array scanner. Quality control analysis of microarray gene expression data was performed as recommended by Bolstad et al. . Briefly, microarray data quality was assessed using the following plots: box, histogram, MA, RNA degradation, housekeeping gene, Relative Log Expression (RLE) and Normalized Unscaled Standard Error (NUSE). None of the microarrays were found to be significant outliers and unsupervised clustering of microarrays revealed no significant batch effects. In addition, physical chip images revealed no manufacturing or spatial artifacts. In short, all microarrays passed quality control checks and were retained for further analysis. Microarray gene expression data was deposited at the Gene Expression Omnibus (http://www.ncbi.nlm.nih.gov/geo/) at the National Center for Biotechnology Information with accession number GSE40379. Microarray data was transformed to the log2 scale and normalized using the GC Robust Multichip Average (GCRMA) method . 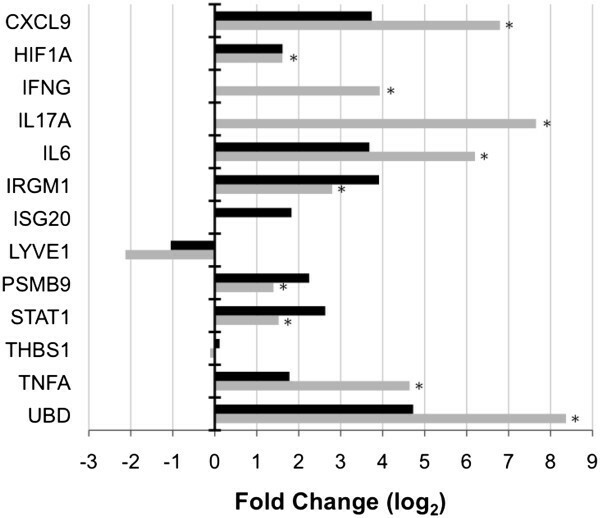 Fold changes were initially calculated by dividing expression levels in DBA/2 mice by those in C57BL/6 mice at each time point (day 0, 10, 14, and 16). A positive ratio indicates greater expression in DBA/2 mice compared to C57BL/6 mice but does not necessarily equate to upregulation. For example, a gene might be constitutively expressed prior to infection (day 0) in both strains and then following infection downregulated less in DBA/2 mice compared to C57BL/6 mice. This would result in a positive ratio indicative of higher expression in DBA/2 than C57BL/6 even though the gene is downregulated compared to the uninfected control (day 0). Therefore, fold changes were also calculated by dividing post-infection time points (day 10, 14 and 16) by the uninfected control (day 0) in order to confirm the direction of gene expression changes. In addition, abnormally high fold change values may result when expression levels below the limit of detection are used as the denominator in fold change calculations. The limit of detection for this study was calculated as an expression level of 35.3, which was the 95th percentile expression level of the absent and marginal probes identified using the MAS 5 algorithm from Affymetrix . Spurious fold change values were avoided by setting every probe set with an expression level below 35.3 to 35.3. Cytokine gene expression was further assayed using the GEArrayTM Q series Mouse Common Cytokines Gene Array from SABiosciences (Frederick, MD). Three DBA/2 and three C57BL/6 mice were infected i.n. with C. immitis RS strain and the lungs harvested, as described above, 15 days after infection. RNA was extracted from each mouse as previously described and pooled within strains. RNA was used to generate cDNA probes that were then hybridized to GEArrayTM Q series platform and detected by chemiluminescence. Gene expression levels were normalized to the housekeeping gene GAPDH. The limit of detection of this platform was taken as twice the expression level of the blank negative control , and any gene whose expression was below this limit was subsequently set to this limit in order to avoid spurious fold change calculations. Fold changes were again calculated by dividing gene expression levels in DBA/2 mice by expression levels in C57BL/6 mice for each cytokine. Genes were selected for GO and pathway analysis if they were modulated greater than two-fold (log2 fold change ≥ 1 or ≤ -1) between DBA/2 and C57BL/6 mice at any time point. Pathway analysis was performed using DAVID  with the background defined as all of the probes on the Affymetrix MGU74Av2 GeneChip. A hypergeometric test was used to identify those pathways from the Kyoto Encyclopedia of Genes and Genomes (KEGG) database that were considered significantly over-represented in the list of differentially expressed genes . Only those pathways with an FDR corrected p-value of <0.05 using the Benjamini and Hochberg (BH) method were considered significant . GO analysis was performed using the BiNGO tool , which is available as a plug in to Cytoscape . BiNGO was used to retrieve the GO annotation and preserved the hierarchical relationship of GO terms for genes differentially expressed between mouse strains. A hypergeometric test was used to identify those GO terms that were significantly over-represented in the set of differentially expressed genes compared to a background of the entire Affymetrix MGU74Av2 GeneChip. Similar to pathway analysis, the FDR associated with multiple testing was corrected using the BH method . Protein-protein and protein-DNA interactions made between the protein products of the genes that were differentially expressed between mouse strains greater than two-fold (log2 fold change ≥ 1 or ≤ -1) at day 14 (N = 416) were determined using the direct interactions algorithm in MetaCore (GeneGo, St. Joseph, MI). The interactions documented in MetaCore have been manually curated and are supported by citations in the literature record. When the proteins encoded by genes form well-connected clusters it is quite likely that they share a common functional response. When protein networks are constructed they often reveal hubs, which represent transcription factors that control the regulation of multiple target genes. RT-qPCR using TaqMan® Gene Expression Assays (Life Technologies, Carlsbad, CA) was performed for the following 13 targets in order to confirm microarray gene expression results: CXCL9 (Mm00434946_m1), HIF1A (Mm00468878_m1), IFNG (Mm01168134_m1), IL17A (Mm00439619_m1), IL6 (Mm01210733_m1), IRGM1 (Mm00492596_m1), ISG20 (Mm00469585_m1), LYVE1 (Mm00475056_m1), PSMB9 (Mm00479004_m1), STAT1 (Mm00439531_m1), THBS1 (Mm01335418_m1), TNFA (Mm99999068_m1) and UBD (Mm00499179_m1). Total RNA was isolated from frozen lung tissues of individual DBA/2 and C57BL/6 mice at each time point using the ULTRASPECTM Total RNA Isolation Kit according to the manufacturer’s instructions (Biotecx Labs). cDNA was reversed transcribed from extracted RNA using the qScript cDNA SuperMix from Quanta Biosciences (Gaithersburg, MD). RNA quality was assessed using the Experion bioanalyzer from Bio-Rad (Hercules, CA). Three C57BL/6 samples (one at day 14 and two at day 16) were determined to be of low quality. Therefore, gene expression of the 13 targets was assessed by RT-qPCR in a total of 15 samples: three samples from both strains at day 10, two C57BL/6 and three DBA/2 samples at day 14, and one C57BL/6 and three DBA/2 samples at day 16. RT-qPCR was performed with the 7900HT Fast Real-Time PCR System (Life Technologies) using 50 ng of cDNA in a 20 μL reaction volume for each target in duplicate. The reaction conditions were as follows: 50°C for 2 minutes, 95°C for 10 minutes, followed by 45 cycles at 95°C for 15 seconds, and 60°C for 1 minute. RT-qPCR data analysis was performed using DataAssist software (Life Technologies) and the significance of differential gene expression between mouse strains assessed with a t-test. Changes in gene expression levels were assessed through relative quantification (RQ) using the endogenous control, glucuronidase beta (GUSB, Mm01197698_m1), because it is one of the most stable housekeeping genes found expressed the mouse lung . Briefly, the threshold cycle of amplification (Ct) for each sample was compared with that of the endogenous control GUSB. The difference in Ct between the sample and GUSB was expressed as ΔCt. For each gene assayed, the difference in ΔCt between each sample and the sample selected as the control (a randomly selected C57BL/6 mouse sample analyzed at each day) was expressed as ΔΔCt. The RQ of each sample was then calculated as 2-∆∆CT. RQ values were log2 transformed and averaged across biological replicates separately for each time point (day 10, 14 or 16) in order to calculate fold change differences between DBA/2 and C57BL/6 mice for comparison to microarray data. This transformation was also performed prior to statistical analyses with DataAssist in order to satisfy the normality assumption, as previously described [74, 75]. Christopher H Woelk, Jin X Zhang contributed equally to this work. This work was performed with the support of the Genomics Core at the Center for AIDS Research (AI36214) at the University of California San Diego, the San Diego Veterans Medical Research Foundation, the Pendleton Charitable Trust, and other research grants from the National Institutes of Health (AI087164). This material is based upon work supported in part by the Department of Veterans Affairs, Veterans Health Administration, Office of Research and Development. The views expressed in this article are those of the authors and do not necessarily reflect the position or policy of the Department of Veterans Affairs or the United States government. None of the authors have direct conflicts of interest with respect to this study. JF, CHW designed the experiments, supervised the research and wrote the paper, TNK contributed reagents and wrote the paper, LW, SV, JXZ, and AS did experiments and/or data analysis.